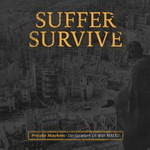 Listen to the newest song by Germany's Suffer Survive - No Fuss is a teaser for the upcoming album Project Mayhem: Declaration Of War. Check out the this track here. The full length will drop in October via Demons Run Amok. Place your pre-order here.